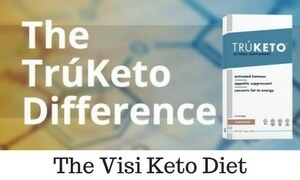 The Vísi Mojo Weight Loss program has everything you need to lose weight safely and effectively. Getting started is easy, and we have a bunch of handy guides to help you up and set sail. 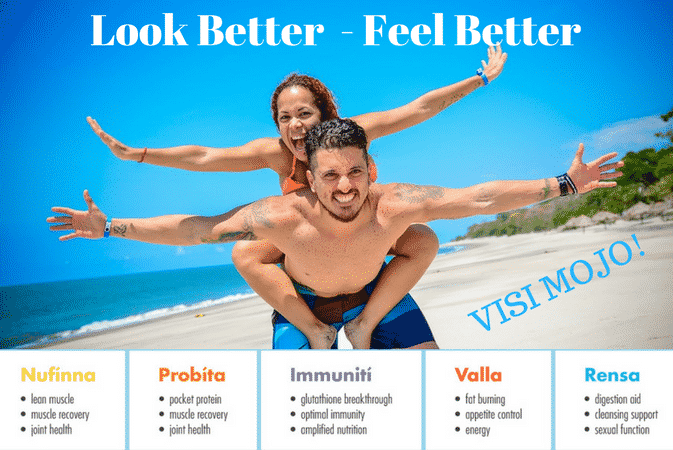 The Mojo Weight Loss program is an ideal combination of Vísi’s incredible products, healthy eating and exercise that combine together to help you lose weight safe and effectively. By following our diet, you can expect to lose 8-12 pounds in your first 28 days, the “Kickstart Phase” and 6-10 pounds every 28 day cycle after that. The Vísi Mojo Kickstart Pack includes all the products you need to complete the 28-day Kickstart Phase. The first 10 days of the Kickstart Phase includes a power detox with 6 Rensa capsules per day. Repeat the Kickstart Phase for accelerated weight loss as needed. 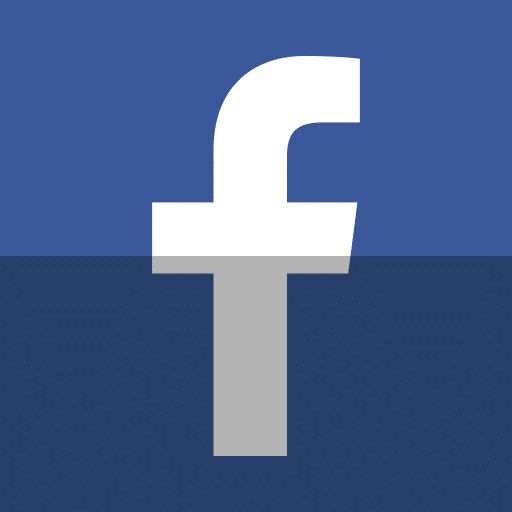 After completing the Kickstart Phase, move forward to the Lean Phase. Take advantage of our healthy meal ideas to maximize your success. Document and track your progress (take a before picture!). Use your Visi products. They don’t work sitting in a cupboard. 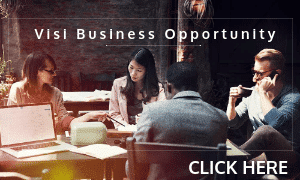 Visi is the first company in the world to combine the antioxidant rich arctic cloudberry fruit with hydrolyzed collagen, which is the most absorbable protein available and is perfectly matched to the only natural protein in our body. We call this potent combination AC² Technology. NOTE: The first 10 days of the Kickstart Phase include a power detox, of which you take 6 Rensa per day (keep up the water as this will flush out toxins etc as Rensa goes to work). TIP 1: We recommend mixing fruits, vegetables, seeds, grains or other healthy additives to your Nufínna shake. You can also choose which meals you prefer to replace with a Nufínna shake e.g having a smoothie for your evening meal. TIP 2: Activity is an important part of weight loss. The goal is to increase the duration and intensity of your workouts over time. Even walking for 10 minutes 3 times a day is a great way to increase your activity. 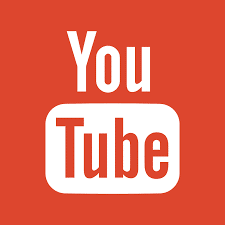 Then when you are ready, gradually increase the time frame. Here are a few examples of food items you can use for your healthy meals. 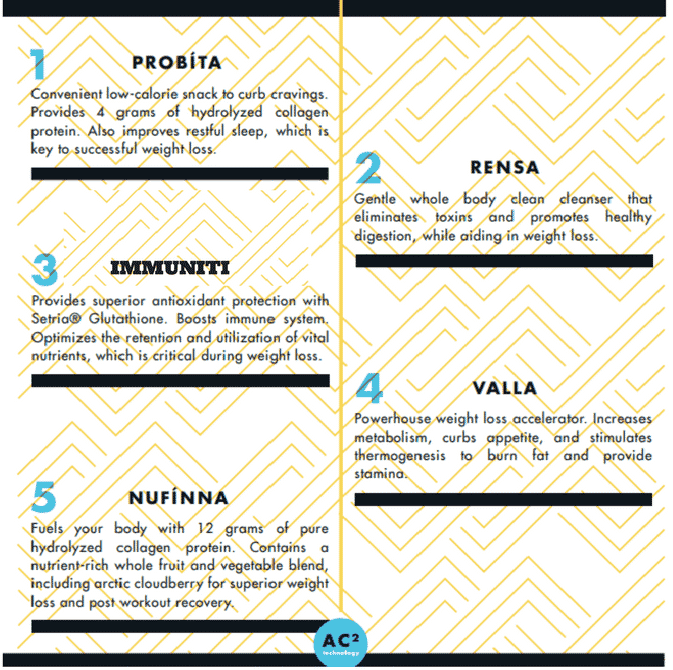 A more comprehensive list can be found in the Vísi Healthy Food Guide which you can download below. 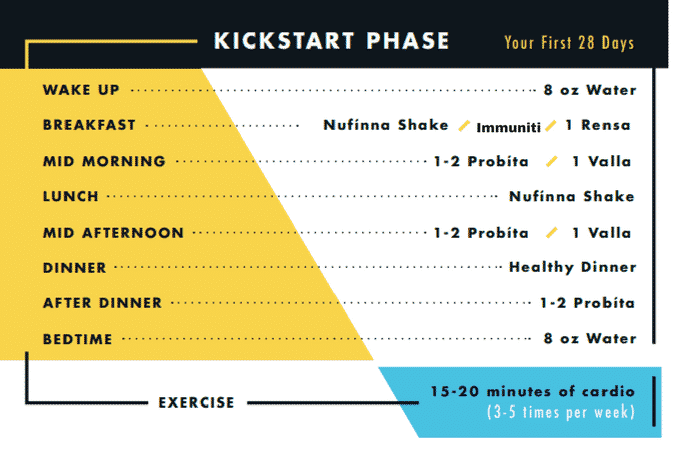 Your first 28 days is your Kickstart Phase, during which you will replace two meals (typically breakfast and lunch) per day with Nufínna shakes and have one healthy meal (typically dinner). 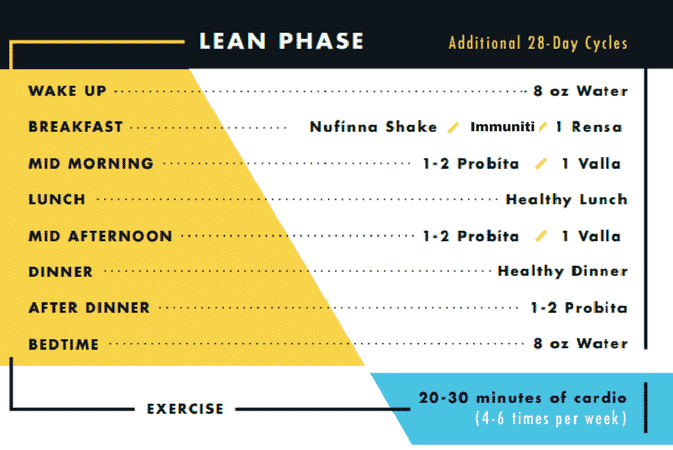 Following your 28-day Kickstart Plan, you will replace one meal (typically breakfast) per day with a Nufínna and have two healthy meals (typically lunch and dinner) with the “Lean Phase”.